In narrative game design and related practices, the role and function of narrative models is described as predominantly pragmatic. 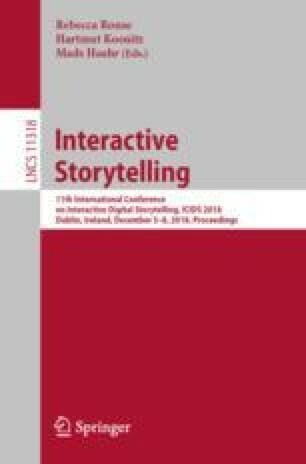 However, we see that many interactive digital narratives (IDN) including narrative video games derive their story structures from the same formulas connected to Joseph Campbell and Aristotle, adhering to the trajectory of the Hero’s Journey and the dramatic arc. We engage with scholarly criticism exposing the supposed ubiquity of these structures and agree that the question of narrative models in interactive digital media requires both further exploration and intervention. We follow up on some proposed solutions by looking at non-Western narrative traditions to expand the corpus of narrative structures available to game designers and other narrative developers. With this paper we raise awareness of alternative structures and simultaneously introduce implementable narrative structures with the aim to expand the design space and range of analytical models for IDN.